The Digital History Fair was held on October 23rd, 2010 in Beauchamp Library in Syracuse, New York. 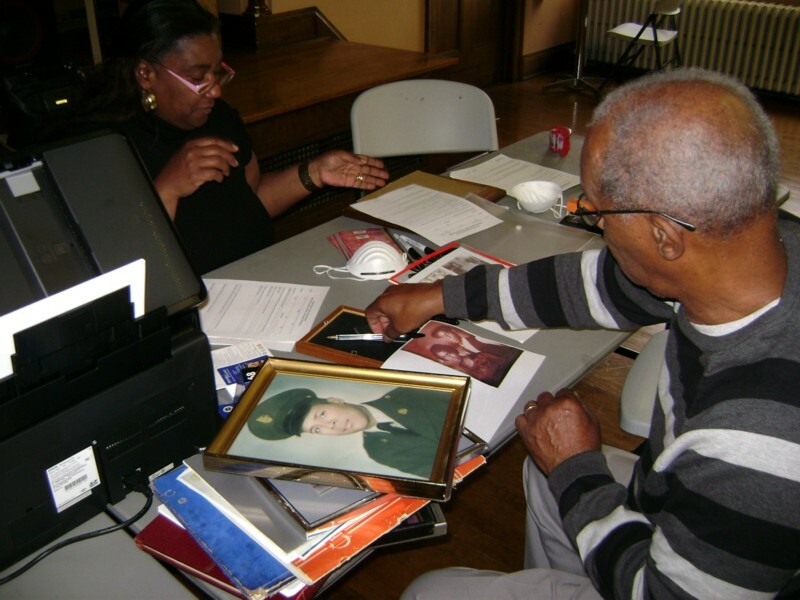 It was a collaborative effort organized by the Black History Preservation Project in which community residents brought in their family photographs and documents to be scanned and added to the shared collection. Volunteers interviewed the participants and filled out metadata forms, recording as much information as possible. The Black Syracuse Project was one of several participating organizations to help out that day, besides the Onondaga Historical Association, Syracuse University’s Library, and Light Work Community Darkroom. Suzanne Preate, Digital Initiatives Librarian at Syracuse University’s Library, scanned the photographs and documents. Here Vernita King, left, is interviewing Marshall Nelson on the family photos he has brought in. The framed image is Mr. Nelson’s brother-in-law, Marvin Belt, who was tragically the first Syracusan casualty in the Vietnam War.